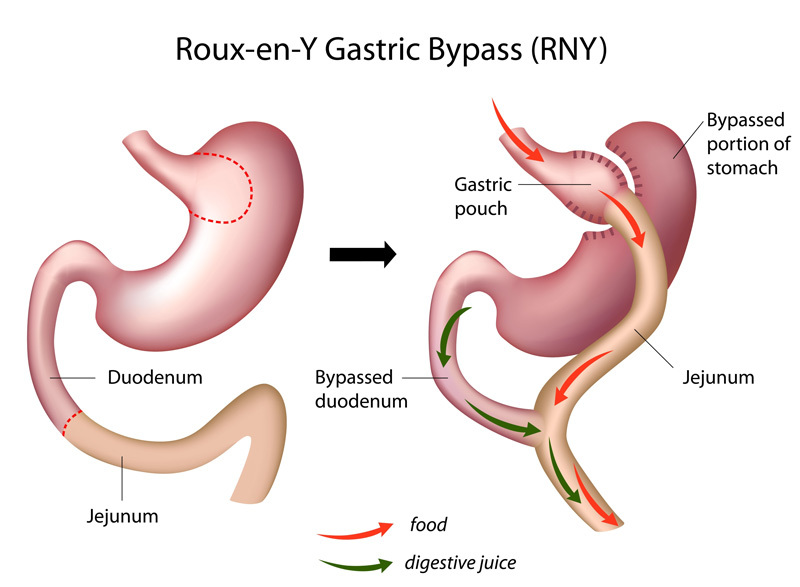 Bariatric surgery, or surgery for obesity, is one of the best options for significant long term weight loss in obese patients and those suffering complications from obesity such as type 2 diabetes, cardiovascular disease or sleep apnoea. There are a number of surgical treatment options with benefits and risks to each. Obesity is a complex medical condition and surgery comprises only one part of its management. All patients will be referred to a dietician experienced in obesity surgery. A specialist physician may need to be involved in care for patients with complications of obesity, such as an endocrinologist for patients with diabetes or a cardiologist for those with heart disease. The anaesthetist may also wish to speak with you prior to surgery if there are specific concerns about your risk under general anaesthesia. A section of the stomach is removed using a surgical stapler. This reduces the capacity of the stomach by approximately 85%. The stomach’s reduced capacity leads to the sensation of fullness faster. There is a reduction of the hunger hormone ghrelin, so you will feel less hungry. This procedure has a small risk of leak at the staple line in the first few days after surgery but fewer long term risks. 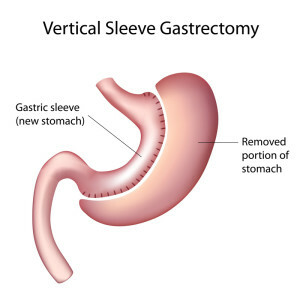 Removal of the stomach is not reversible. 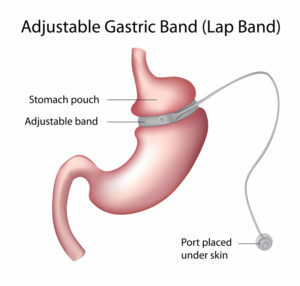 A silicone band is placed around the upper portion of the stomach, connected to a port under the skin of the abdomen. Once you have healed from surgery, the band is inflated with water. This creates a small pouch above the band, which rapidly fills when you eat, causing the sensation of fullness. This procedure is well tolerated but carries a risk of significant long term complications and requires lifelong management of the band. A small pouch is created from the upper stomach using a surgical stapler. This restricts the amount of food that can be eaten. Next, the small bowel (intestine) is divided and reattached to the stomach pouch in a way to bypass about half of the intestines capacity to absorb nutrients. Less of the nutrients and energy you consume is absorbed. This procedure tends to result in greater weight loss but has a higher risk of complications and malnutrition. Each operation carries benefits and risks. For more information, the Obesity Surgery Society of Australia and New Zealand, the American Society for Metabolic and Bariatric Surgery and the International Federation for the Surgery of Obesity have general patient information on different treatment options. However, each individual is different and the recommended treatment options will be tailored to your needs and medical situation. If you have any questions or concerns about your surgical options, or would like an information pamphlet to be sent to you, please contact Mr Jacob Vanyai. An out of pocket fee for bariatric surgery usually applies. This amount may vary according to your level of health cover and you should check with your health fund if your level of cover includes surgery for obesity, as this may have changed recently. There may also be a gap payment to the hospital, anaesthetist, surgical assistant or to cover lab tests or X-rays taken during your stay.